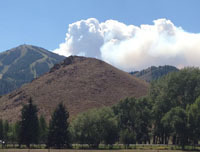 Air quality in parts of the central Idaho mountains has reached an “Unhealthy” designation, and the Idaho Department of Health and Welfare’s Division of Public Health is alerting people to limit outdoor activity. The Department of Environmental Quality has predicted unhealthy levels for areas of Boise, Elmore, Blaine, Camas and Custer counties. Because of wildfire activity and weather patterns, air quality conditions are not expected to significantly improve through this week, the department said. People exposed to smoke may experience symptoms such as coughing and shortness of breath. Older adults, infants, children and people with medical conditions such as asthma, chronic obstructive pulmonary disease and heart disease are often more affected. People are advised to seek medical treatment for uncontrolled coughing, wheezing, choking, or if they have difficulty breathing once they move back indoors. Everyone should avoid heavy work or exercise outdoors when the air quality index reaches unhealthy levels. Older adults, small children and people with respiratory conditions or heart disease may be more sensitive to poor air quality and should stay indoors and avoid heavy work. Drink plenty of water. Staying hydrated helps dilute phlegm in the respiratory tract, making it easier to cough out smoke particles. Plan on coughing; it is nature’s way of clearing your lungs. Avoid caffeine products, sugary drinks and alcohol because they have a dehydrating effect. Stay cool if the weather is warm. Run your air conditioner to recirculate air. Turn the fan blower on manually so it continuously filters the air in your home. If you wear contact lenses, switch to eyeglasses in a smoky environment. Not all areas of the state have air quality monitors, so people are encouraged to be cautious if visibility is affected because of smoke and particulates from wildfires.